At the Flint Children’s Museum, children of every age are encouraged to explore, play and learn! There are over 40 hands-on educational and fun exhibits available at the museum. 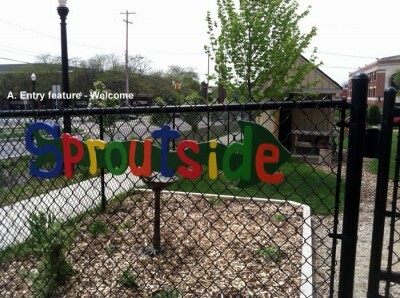 The Nature Explore Classroom at The Flint Children’s Museum has been lovingly named Sproutside. Trees line the path around Sproutside with gardens and flower beds incorporated in many areas. A variety of colorful plants with beautiful flowers and vibrant produce provide splashes of color throughout the classroom. The grass is kept lush and green. Most features, including the climbing areas and some furniture are made from natural wood materials. All permanent features were built to withstand the fluctuating and intense Michigan weather and do not require extensive care. The Michigan Sandbox has a variety of features that help teach about the region while the native garden is made up of plants that can be found in the local area. This enables the families to become more familiar with these plants. The children asked for a place to “get messy” so a mud pie cafe was built. Adults requested another educational component in the garden, so signs were added that tell the health benefits of each of the plants grown. The Nature Art Area has a variety of crayons, paint, leaves, flowers and other items for use. Children can often be found making nature rubbings or cloud paintings. There is a weather window that the children can look through to learn what types of clouds are in the sky and then encouraged to paint or draw a picture of what shapes or animals they see in the clouds. Children use dirt, water and prepared mud to make mud pies and decorate them with other natural items. The Music and Movement area often has music playing with children using instruments such as bongos and rain sticks to add to the sound. Deer, squirrel and bird calls are often used to create an animal orchestra. The programming in Sproutside is centered around nature education. Children are given a variety of opportunities to explore topics such as Michigan mammals, native plants, gardening, the water cycle, and insects. Activities are adapted to many different age groups and abilities. Free access days and $2.00 Tuesdays have been advertised to allow more families from the surrounding community to enjoy the museum. The museum also offers Summer Fun Passes, which include unlimited admission for the summer. Last summer, 158 families participated in the Summer Membership Program, using these passes so that they have a safe and fun place to spend time outdoors. Throughout the summer, the museum partners with other organizations. The Kettering University Green Engineering Organization brings environmental education programs to Sproutside to teach kids about being “green”. The Kearsley Park Players perform in Sproutside for a fun outdoor theater experience. These different partnerships help to involve more families in the Nature Explore Classroom. The Sproutside blog highlights the happenings in the classroom on a daily basis and families are encouraged to interact with these posts by giving suggestions and comments. The Flint Children’s Museum truly is a place where the power of play inspires lifelong learning!